If TV's Portlandia hasn’t hooked you on all things Portland, the Portland Garment Factory surely will. 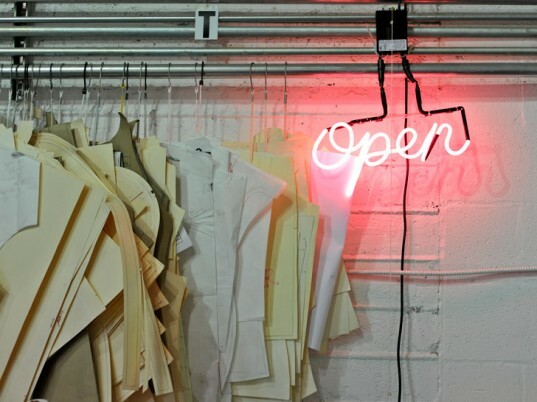 The artisanal workshop, founded by self-taught seamster Britt Howard, offers a range of services from pattern construction to garment production. All work is done on-site in the southeast neighborhood of Montavilla to cater to the growing ranks of designers in the region. (Three out of eight Project Runway winners, including season 8's Gretchen Jones, are from the metro area.) With a staff that's as earnest as it's endearing, the factory is unique in an industry prone to outsourcing. It’s no coincidence that a plethora of independent designers, including three Project Runway winners, hail from the Portland area. The Oregon city crackles with creativity and vigor, coupled with a yen for all things green. When Britt Howard launched the Portland Garment Factory in 2008, she filled an obvious vacuum: a garment workshop that caters to grassroots companies while capturing Portland’s homegrown spirit, all without the high minimums and complicated production logistics that most apparel manufacturers require. Portland Garment Factory caters to grassroots companies without the complicated production logistics. Portland Garment Factory now serves over 20 designers and brands, including Leanne Marshall, Poler, Girl and A Mouse, and Bonfire Snowboarding, to name a few. But the Stumptown Coffee-loving owner has no plan of stopping there. With a new business partner and on its third location, the expanding company plans to launch its own collection of womenswear called “Houseline.” Targeted at the eco-conscious woman, the line is set to debut in fall. Rosemary Robinson, co-owner of PGF, is a pattern expert whose first introduction to the workshop was as a potential client. Within a few months, she and Howard became business partners, and the company has been thriving ever since. Now at its third location, the company has yet to reach maximum capacity. PGF not only assists with everything from start to finish, says Howard, but it can also hone in on just one element of production, such as sourcing, size-grading, or sample construction. Its only requirement: as much advanced notice as possible. Originally a company of one, PGF now has two owners, 10 employees, various subcontractors, and a full-fledged internship program. Not bad for a company just two-and-a-half years young. Quality control, low minimums, and local operations are the keys to PGF's success. Clients are assured that each garment passes through expert hands. They're also encouraged to check in on each phase of production. Howard hopes that by working with PGF, her clients see firsthand the benefits of domestic production, including fair wages and a commitment to sustainability. What's next? Confident it has the production aspects down, PGF will be tackling fulfillment as its next feat. Although it currently ships directly to clients, PGF would like to implement shipping orders to stockists and stores.